The summer is well and truly gone, and the holidays with it! I know a lot of parents will be pleased to have some normality back to their days but I quite enjoyed the holidays. I think it’s because, prior to maternity leave, I worked full time so I would only get to take the odd day here and there with Oliver. Being able to spend every day with my children has of course been mega stressful, but it’s also been really nice. To watch their relationship grow each week has been incredible. Anyway, back at the start of the summer I wrote my Summer Holiday Wish List and a few weeks back I did an update of what we had managed to tick off. Now the holidays are done and dusted I thought I’d look back and see what we missed, there’s always October half term right? We only managed to tick off a couple of things over the second half of the holidays, but we did plenty of other things which I hadn’t thought of. We had another trip to Beamish, and the weather was a lot better this time around. Plus Oliver didn’t have me pushing the pram off-road! He loved taking our friend’s daughter on the train, I can’t wait for Grace to be big enough to go on! We took a trip with my parents to the coast on a day with the worst weather, so we went into the Blue Reef Aquarium instead. It was nice to spend the day with them, and to go back to the aquarium, but Grace was a bit too young I think to be interested in the fish and marine life. She’s much more into animals! Oliver enjoyed it, the seals mostly I think, but not much had changed since we used to take Oliver when he was younger. If I’m honest it could do with a bit of an update and it wasn’t great value for money (but we did buy tickets “on the door”). We did stumble across a great cafe, instead of eating in the aquarium. If you’re ever in Tynemouth I would definitely recommend visiting Tynemouth Surf Cafe. It was very quirky and cool, and the pulled pork nachos I ordered were soooo good! Oliver had a ham and cheese toasted sandwich, a cross between a pitta and a panini, and said it was the best toastie ever! High praise indeed! Yes, I did ask for my nachos without salsa and jalapenos! 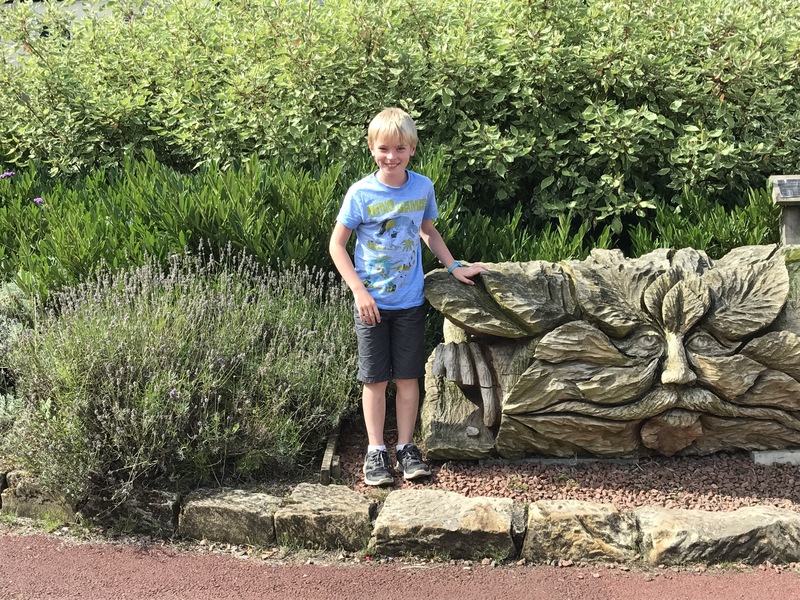 I was lucky enough to be invited to a store opening for The Simply Small Co in Newcastle’s Grainger Market, so I took the opportunity to take Oliver to the Discovery Museum while we were in Newcastle. We hadn’t been to the Discovery Museum for a good couple of years so I was looking forward to seeing what was on display. Oliver enjoyed the Science Maze, and the Newcastle Story exhibition was fun (as ever). He also enjoyed looking at all the boats and maritime things in the Story of the Tyne. Grace napped after we ate our picnic, so I’m not sure what her favourite part was, but I really liked all the vintage fairground games in the “All the Fun of The Fair; 135 Years of The Hoppings” exhibition which is only on until 1st October. If you’re in the area, go take a look! Also, I must just say, go visit Natalie at The Simply Small Co if you’re in Newcastle, or check out her website if you’re not. She has gorgeous clothes, gifts and accessories for children up to 6 years old… I could have bought almost everything in the shop! What else did you do, which wasn’t on the list, I hear you cry! It had been a long time since I had time with friends, so I jumped at the chance to have the evening with them in the holidays. There was lots of laughter and tasty food! Now I didn’t go, so I can’t give a true opinion of the day but the photos looked great and Oliver talked about it for ages afterward so it must have been a good day out! Down at the Farm is a local farm which has been transformed into an attraction featuring everything from rabbits and guinea pigs to reindeer and owls. We’ve been visiting on and off for eight years, but we haven’t been for a while (partly because of the pregnancy/lamb situation) so it was nice to go back this summer. Nothing had really changed but you can get discounted season tickets at different times of the year so it’s a cheap and fun day out. If you’re local to it, I would keep an eye out on Groupon in the New Year to grab a bargain! This was our first visit to Kirkley Hall and we had a great day. I’m going to write a full post about it soon, but I would definitely recommend a trip there if you’re ever in the North East. I can’t wait to go back and have a look at their Activity Centre which has high ropes and assault courses… I think we’ll have to leave Grace at home that day though! Oliver and I hadn’t spent time together for ages, so Grace stayed with the Grandparents and off we went to the cinema. We saw “Captain Underpants: The First Epic Movie” and stuffed our faces with sweets. Oliver thought it was hilarious (me not so much), so if you have a child around 6-9 years I’d say let them check it out. We treated ourselves to a McDonald’s afterwards too. Oliver was pretty pleased with his Quarter Pounder meal, but as is often the case his eyes were bigger than his belly and he couldn’t quite fit in all the milkshake!